The world’s biggest social networking site want to make itself more big and hence is giving away free mobile recharge of Rs.50 on new registrations. 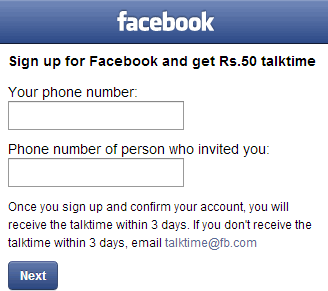 To avail this offer, you just need to have a new mobile number (even old but should have never be used on Facebook). Just register a new account using your mobile number and you will get Rs. 50 recharge within 3 days absolutely free. 1. Visit Facebook’s free talk time offer page. REMEMBER you should be logged out of Facebook. 2. Fill your new mobile number and a number of your friend or you can also leave it blank. Click on “Next”. 4. Now you will receive a confirmation code on your mobile. Type it in the text box that pops-up and click on “Submit”. 5. That’s it. You will receive your free Recharge within 3 days of Sign up. REMEMBER if you don’t receive your free recharge within 3 days, then you can email Facebook on [email protected] with your phone number. We need a lot more inshgits like this!